and the directrix x = -1. Enter a point at the focus (1, 0) , and another on the curve, labelled ‘A’. Construct a tangent through A. construct a straight line through A and the Focus, and find its other intersection (‘B’) with the parabola (use ‘Add point’ with Ctrl). 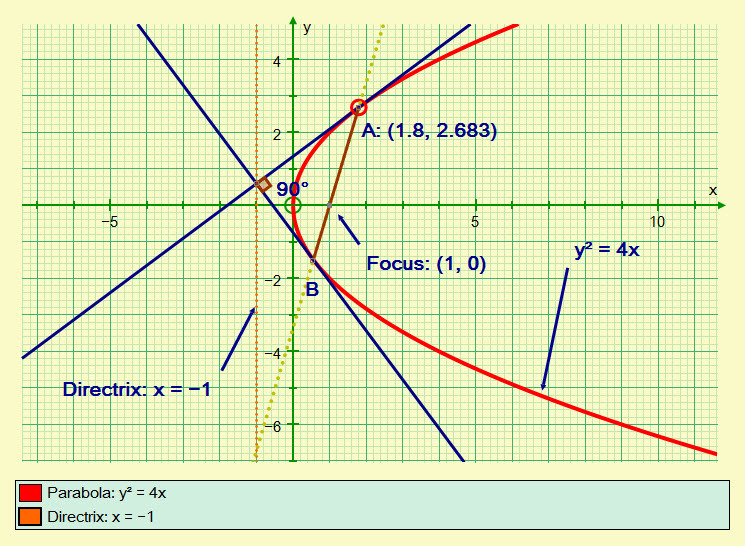 Double-click on ‘B’ to establish its association with the parabola, then draw a tangent through ‘B’. Find the intersection of the two tangents, and display the angle (make sure you are in degrees). Move ‘A’ around to domstrate that the two tangents meet on the directrix at 90°. In each file, an ANIMATION is set up to demonstrate this. « Why is the Javelin not thrown at 45°?